Description: Excellent example of Munster’s Ptolemaic map of the region between the Black Sea and Caspian Sea extending south to include all of Armenia Maior and part of Armenia Minoris. 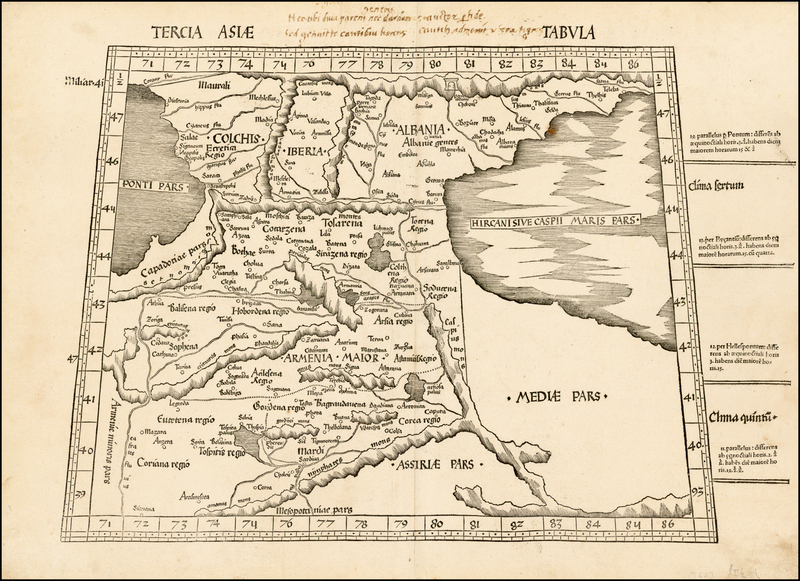 Munster’s map shows Noahs Arc in the Caspian Sea, believed to have come to rest in a mountain in Armenia according to the map. 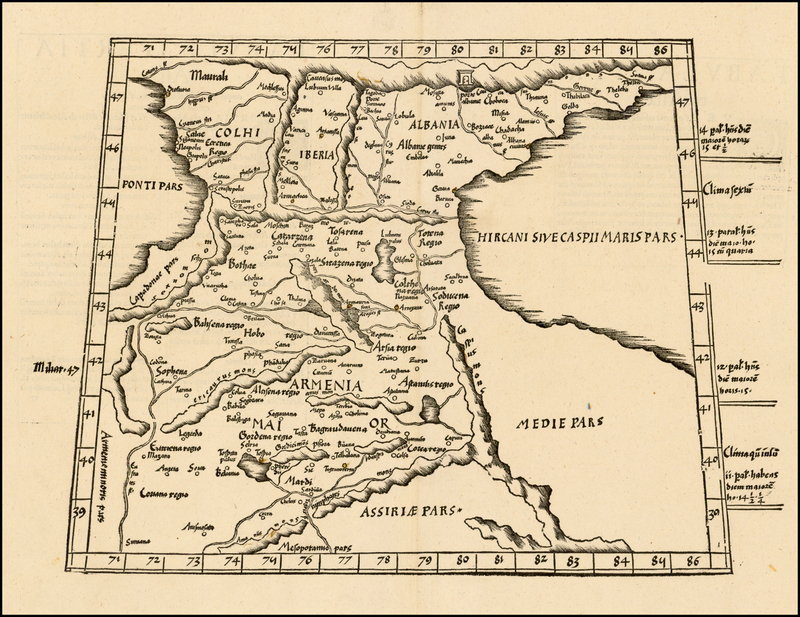 Shows Armenia Maior, Iberia, Albania, Colchis, Porte Albanie, the Euphratis River, the Tigris, Assyriae, and many other place names in the cradle of civilization. The map is unchanged from the 1540 edition. Munster’s Geographia was a cartographic landmark, including not only Ptolemaic maps, but also a number of landmark modern maps, including the first separate maps of the 4 continents, the first map of England and the earliest obtainable map of Scandinavia. Munster dominated cartographic publication during the mid-16th Century. 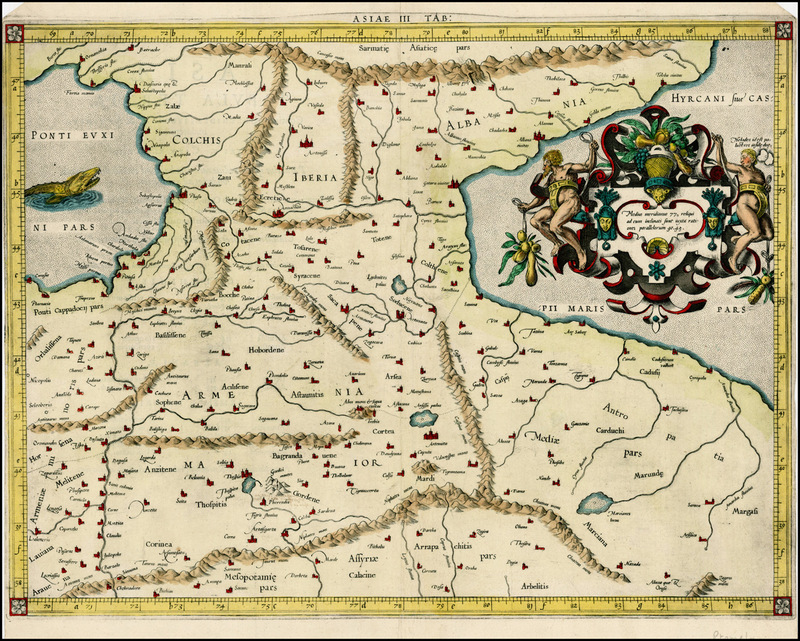 Munster is generally regarded as one of the three most important map makers of the 16th Century, along with Ortelius and Mercator. Munster was a linguist and mathematician, who initially taught Hebrew in Heidelberg. He issued his first mapping of Germany in 1529, after which he issued a call geographical information about Germany to scholars throughout the country. The response was better than hoped for, and included substantial foreign material, which supplied him with up to date, if not necessarily accurate maps for the issuance of his Geographia in 1540. Description: A striking example of Waldseemuller’s map of the region between the Black and Caspian Seas, centered on Armenia. The first modern atlas, prepared by Martin Waldseemuller using the translation of Mathias Ringmann. 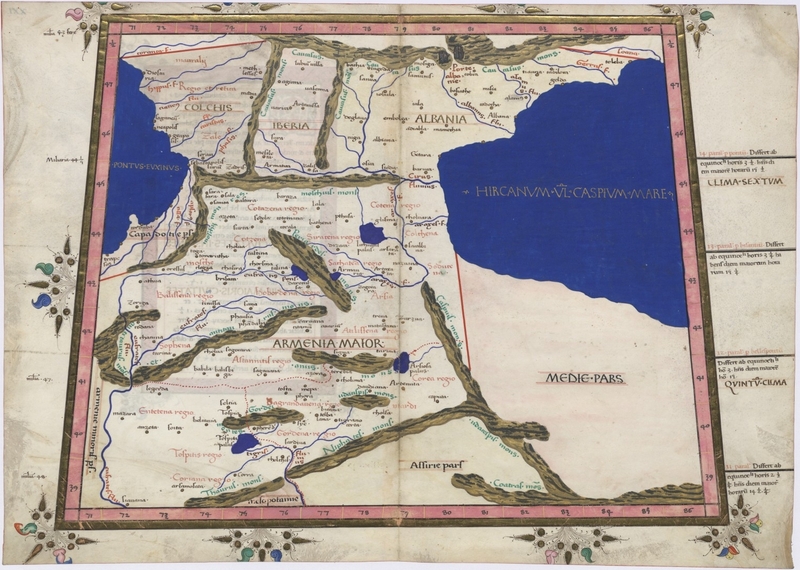 This is one of the most important editions of Ptolemy, containing many new regional maps. Twenty new maps based on contemporary knowledge were included by Waldseemuller, in addition to the traditional twenty-seven Ptolemaic maps derived from the 1482 Ulm edition. Martin Waldseemuller and his associate Mathias Ringmann, prepared this edition of Ptolemy, partly at the expense of Duke Rene of Lorraine. It was brought to completion by Jacobus Eszler and Georgius Ubelin. 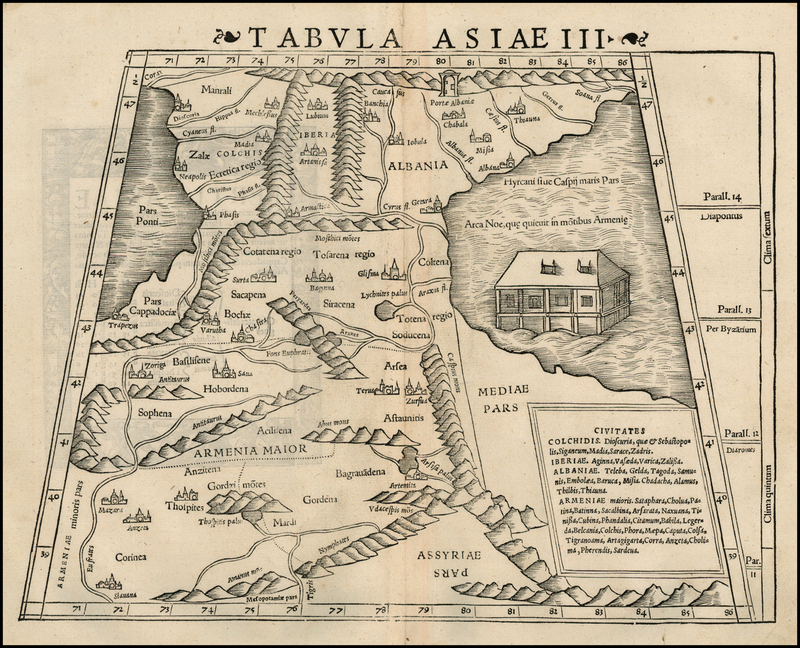 The atlas contains the first map in an atlas entirely devoted to America (Tabula terre nove), often called the “Admiral’s map” after Columbus. The map of Lotharingia (the first map of the Duchy of Lorrain), printed in black, red and olive, is one the earliest examples of color-printing. This edition was reprinted in 1520 using the same woodcut blocks. Description: Marvelous map of Armenia and the regions between the Balck Sea, Caspian Sea and the Caucus Mountains. 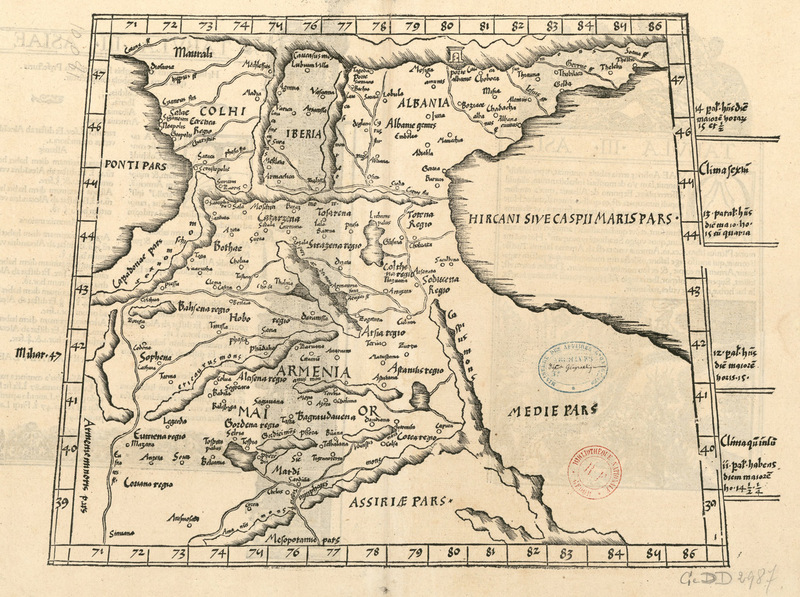 One of the earliest obtainable maps of the region and one of the most strikingly engraved. Latin Text on the verso.